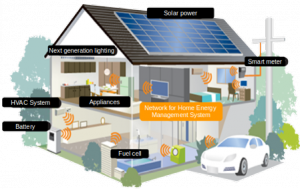 With the smart grid revolution, house energy consumption will play a significant role in the energy system. Home users are indeed responsible for a significant portion of the world’s energy needs portion, but are totally inelastic with respect to the market (i.e. the energy demand does not follow the price of the energy itself). Thus, the whole energy generation and distribution system performance can be improved by optimizing the house energy management. Those problems are concerned by multiple objectives such as cost and users’ comfort, and multiple decision makers such as end-users and energy operators. 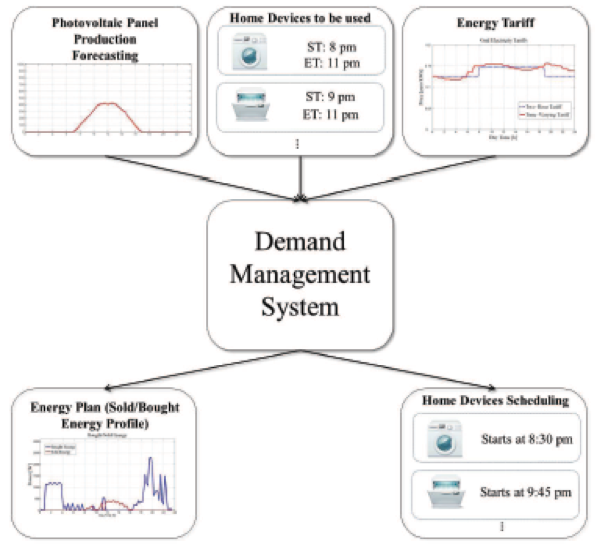 We propose a home automation system that can monitor appliance scheduling in order to simultaneously optimize the total energy cost and the customer satisfaction. The key challenge of this project is to propose new optimization models and new hybrid algorithms to the demand side management of smart grids in a context of uncertainty and in the presence of several conflicting objectives. Those complex optimization problems are also characterized by the presence of both continuous and discrete variables. 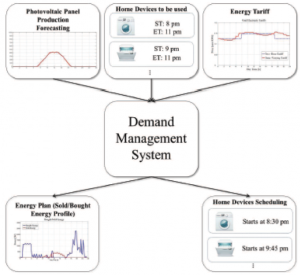 – New efficient and realistic models for the demand side management problem. The problem is formulated as a constrained mixed integer nonlinear and multi-objective optimization model to schedule both electrical and thermal loads over a time horizon of one day and under different constraints. Three objectives are considered: energy cost, carbon dioxide emissions, and discomfort caused by allowing flexibility of loads within an acceptable range. The smart home includes a micro combined cooling, heating and power system, a photovoltaic panel, a battery, a thermal energy storage, an electric vehicle, controllable and non-controllable loads. – New hybrid matheuristics combining evolutionary algorithms with mathematical programming. An original optimization algorithm integrating an exact linear programming solver into a multi-objective evolutionary algorithm has been developed. To validate the effectiveness of this approach, a number of simulations have been performed and compared under various scenarios. In addition, it turns out that our proposed solution can lead to a significant improvement for both comfort and energy saving as well as a carbon dioxide emissions reduction compared to the reference scenario. Invited Keynote speaker of E-G. Talbi, “Optimization of smart grids: opportunities and directions”, ICOA’2017, International Workshop on Optimization and Applications, Meknes, Morocco, March 2017. Z. Garroussi, R. Ellaia, E-G. Talbi, J-Y. Lucas, «Hybrid Evolutionary Algorithm for Residential Demand Side Management with a Photovoltaic Panel and a Battery. ICAAIRO Int. Conf. on Control, Artificial Intelligence, Robotics & Optimization, Praga, Czech Republic, May 2017. Z. Garroussi, R. Ellaia, E-G. Talbi, J-Y. Lucas, «Hybrid multi-objective evolutionary algorithms for the residential demand side management with thermal and electrical loads». MIC’2017 Metaheuristics International Conference, Barcelona, Spain, July 2017.